This last week has been super crazy, busy, and exciting. My first transfer is over today! That has added to the excitement of what was happening next transfer. I will be staying in my area of Alondra. I will still attend the Gardena Ward with another set of Elders. The Nu’umau ward will be taken over by a set of real Samoan elders. My companion will be … Elder Manning ( I think that is how it is spelled). I haven’t met him yet and no one seems to know him. The Zone Leaders told me he was a District Leader from Downey Zone. I’ll send you guys a pic of him next week. 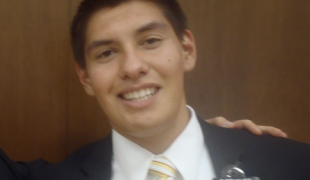 Elder Street will be a trainer, and he is moving to a YSA branch in Kent Zone. 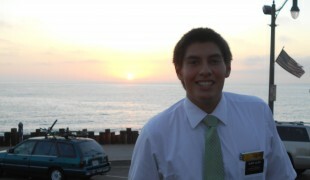 Elder Fertig will be staying in his area, so I will see him a lot. He will be senior companion for the first time. I am excited to get back working in my area. With the other elders we didn’t do much in my area. I had the best dinners on my mission so far. A Samoan Family took us to the best buffet. It was called Vegas Buffet lol is was super nice. They had a lot of sea food. There was a TV crew there filming also, I think for the local news or maybe the food channel. The next day another member took us to the best burger place in the world. It was called the Counter. We had 1lb organic bison burgers with basically whatever we wanted on it. It was super big, and I barely finished it. Sounds like you guys are really busy out there. Thanks for contacting Michael, hope to hear from him soon. Tell the Scheibmeir Family good luck in Spokane! Good to hear Jessica had a nice birthday. We also have stake conference this next week! Good luck on teaching your class. I think I am beginning to understand how important family history work is. Tell Sharon and the boyz I said hello! Pics: We saw a Rolls-Royce in Gardena! Not sure what a car like that was doing there, but we drove right next to it! It was monopoly season at McDonald and we went there every day for over 2 weeks. Those are all the pieces we collected and didn’t win anything! Kinda glad it is over. I have no money left though and have to wait till next month for more 🙁 Starting to learn the importance of managing my money. We had Elder Wright’s birthday this week. He was in my district at the MTC. His trainer is Elder Osciezanek from Colorado, who is also the new DL since my trainer left. Saw a huge black widow hanging in the sidewalk. There was a car accident outside our apartment last night. Tons of emergency people. Had some krispy kreme donuts! They are really good! If you could send me a spanish-english dictionary or some thing that would be helpful 🙂 Love you guys and thanks for all you help!